A story circulated in Hartford toward the end of the 19th century about a young bootblack who worked on a steamship. Perhaps he found the competition on dry land too stiff; the number of boys working in the trade always grew when times were hard. But even the meager sum that shining shoes brought into the family sometimes meant the difference between eating and going hungry. As a stocky, bearded man walked by on the deck, the boy asked him if he needed a shine. The man clearly did, but the boy remained polite enough not to criticize, just to inquire. The man stopped and lit a cigar; the boy went to work. When he finished, he held out his hand waiting to be paid. The man slipped him a paper bill, in a quarter-dollar denomination. This angered the boy. He wanted coins, not “worthless” greenbacks. Holding paper money was a show of faith in the US government, both during and after the Civil War, and those who hoarded gold and silver were waiting for the North to lose the conflict, or to collapse altogether. Those who used paper money were optimists and patriots. A bystander saw the young man’s distress and approached him. “That was General Grant,” he told the boy. Bootblacks have long been the subject of nostalgia in American culture, with stories in the local press about colorful figures like Speck Macton and Cesar Diggs. But the reality of a bootblack’s life was no quaint tale. The art of shining shoes, as poorly as it paid, became a trade that kept working people one step ahead of poverty. Hartford regulated the trade as far back as 1888. The city limited the number of bootblack licenses to 17 that year. Authorities allowed only one license per family and took away a boy’s permit for almost any reason. Police also had the power to arrest any bootblack operating without a license. The number of bootblacks swelled when the Great Depression hit Connecticut. 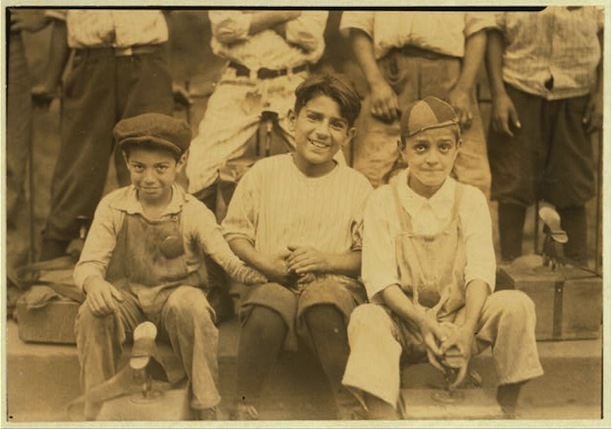 As unemployment increased, so did the numbers of men and boys looking for income. Bootblacks rose from 100 to 250 in Hartford alone. 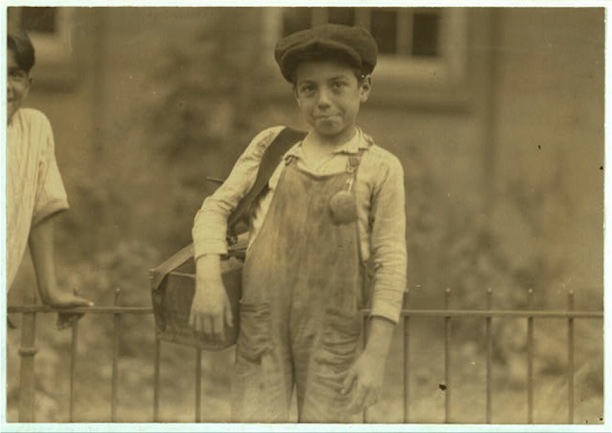 One boy’s story typified the hardships faced by the poor of the city. Danny D’Onofrio was 12 years old and lived with his family on Charles Street in Hartford’s poorest neighborhood. His father had died; his mother was raising seven children. One of his brothers was in the hospital with a deformed spine, and one of his sisters had her own child. Danny was the primary breadwinner. Like others, he worked from the morning to late at night, seven days a week, and relied on all his customers to pay him for his services, but that was not always the case. “Sometimes not all the cops pay for their shine,” he once told a reporter. Shoe-Shining Survival: A Public Nuisance? The boys defended their livelihood at city hall. Dominic J. Curio and Sergio Gionfriddo were officers of the Hartford Boys Boot Black Association and spoke on behalf of their co-workers. Dominic explained how he bought groceries and paid the rent for his family who lived in deep poverty. He spent seven days a week on the job, and earned a total of $6.00 to $10.00 for a 60-70 hour workweek. (In contrast, electricians made $6.00 for one eight-hour day during this time.) Dominic provided an “able defense” before the elected officials, and taught the lawmakers the real conditions of poverty that festered as the Depression grew. “If you take us off the busy streets and put us on streets that are not busy, we won’t make enough to buy shoe leather,” Dominic told the council. The bootblacks’ younger brothers and sisters ran barefoot on the hot summer streets, he said. Finally, in 1932 the city council accepted a plan offered by a social service group to allow bootblacks to work at designated stations around the downtown area. Taking into account the demands of local businesses, the city limited the number of shoeshine boxes on certain streets. The Friends of Hartford Boys mapped out 200 sites that allowed from one to four bootblacks to set up shop. The plan was still opposed, to no avail, by the larger, more established bootblack stands that employed individual shoe shiners and made a profit off their work. By 1953 the city had designated 325 stations in the business district. 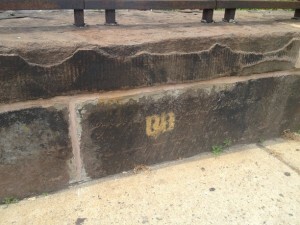 Still visible today are some of the official “BB” marks painted on Hartford curbs where these young men labored. 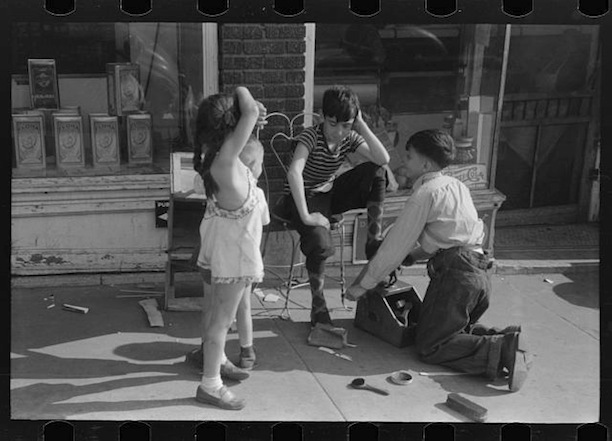 “Aldermen Hear Defense By Bootblack: Head of Boy Shoe Shiners Eloquently Protests Plan To Remove Them From Streets.” Hartford Courant. July 20, 1930. “Bootblacks and Ragpickers.” Hartford Courant. October 26, 1888. “Boy Bootblack ‘Station’ Plan Is Suggested: Ordinance Body Gets Proposal to Let Lads Stay Downtown Without Conflict With Stands.” Hartford Courant. July 14, 1932. Berendt, Edward A. “Boy Bootblack Philosophizes On Life Here: Danny D’Onofrio, 12, Reluctantly Grants Press Interview and Has His Picture Taken He Likes to Shine Fat Men’s Shoes.” Hartford Courant. December 22, 1929. “News and Notions.” Hartford Daily Courant. November 20, 1875, Morning edition. “Ragpickers, Bootblacks: Badges for the Year to Be given out by Police To-Day.” Hartford Courant. April 1, 1902. “The Italian Bootblacks: They Should Be Required to Live in Peace.” Hartford Courant. September 6, 1895.